Humans like to build cities that reach for the sky, but sometimes they also build downward. Whether for protection, or just because they can, we've created many cities beneath the Earth's crust - or dug deep into the rocky faces of mountains. Here are nine of the most awesome. 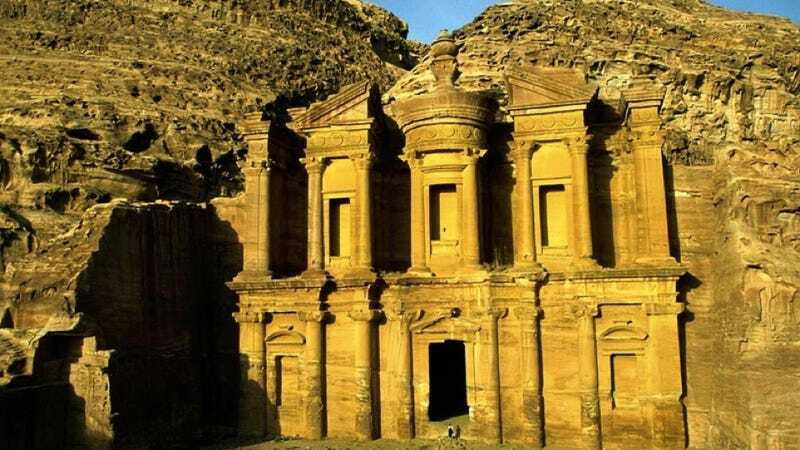 Built in Jordan in the 2nd century by the Nabataeans, this massive monastery is just one of hundreds of dwellings carved into the rocks. People have lived for hundreds of years in this village, carved into the rocks of a hillside overlooking Rhone, France. Some of the carvings in the region look downright spooky, like this skull face, but others are simply doors and windows into homes that stretch back into cozy caves. Beneath the streets of Saskatchewan, Canada town Moose Jaw, there lurks an extensive network of tunnels, full of what were once shops, factories, homes, and speakeasies. Rumor has it that Al Capone used them for smuggling, and that Chinese immigrants lived and worked there in the nineteenth and early twentieth centuries. There is no solid evidence either way, but you can take a tour. Learn more via Tunnels of Moose Jaw. Beneath the streets of this small Kansas town, residents recently discovered three blocks of abandoned storefronts. No one is sure what they were used for. Were they the homes of escaped slaves, who hid from authorities? A haven for bootleggers in the 1920s? Or was it simply a part of town that was abandoned and turned into landfill for the Leavenworth we know today? Connected to metro stations and shopping districts, Montreal's "underground city," or Réso, boasts 20 miles of tunnels, making it the largest such installation in the entire world. This ancient Turkish city could house up to 20 thousand people, reached eleven stories below ground, and was built in the 7th or 8th century by Christian villagers hiding from persecution and brigands. Central Turkey, known as Cappadocia, is full of underground cities because the volcanic rock in the region is so soft that people can carve tunnels quickly. Once home to NORAD, this underground city was built beneath Colorado's Cheyenne Mountain to hold thousands of people and withstand a nuclear attack. Though it was secure during the Cold War, advances in missile technology mean that it's no longer a sure bet when the nukes fall. So NORAD has been moved to a new location, and the city remains standing - some people still live there but it may become a museum soon. Like NORAD, Beijing's famous Underground City was built during the Cold War to withstand a nuclear attack. Now the vast network of tunnels has become a tourist attraction. In Portland, Oregon on the west coast of the United States, there's a vast network of underground tunnels, former homes and businesses. The place was used almost entirely for bars before and during Prohibition, and earned the nickname "Shanghai Tunnels" because unwary sailors were often "shanghaied" - drugged while drinking, only to find themselves aboard a ship the next day, where they had to work until they hit another port. This io9 Flashback was originally published in 2011.